Late in the afternoon on a hot July day, most of the people at the Rice County Fair in Faribault seem to have little interest in talking politics. 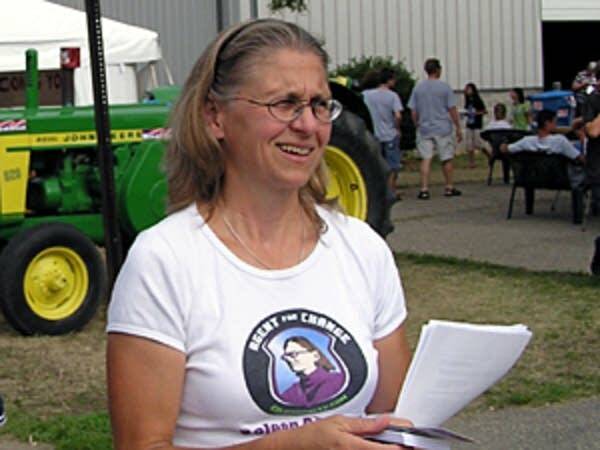 DFL congressional candidate Coleen Rowley, wearing her "Agent for Change" t-shirt, is armed with a stack of campaign literature. She carefully chooses her targets. "I'm trying to get people who look like they're walking slowly with no purpose, so that they look like they're not going to be upset if I stop them," Rowley explains. Rowley, who says she voted for George Bush in 2000, announced her campaign against Republican two-term incumbent, and Bush ally, Rep. John Kline in early July 2005. Since entering the race, Rowley has been highly critical of Kline's support for the Bush administration -- especially its policy toward Iraq. "We have put all of this money into 'shock and awe,' thinking it's going to make us safer, and meanwhile cutting for domestic things like education and transportation and even law enforcement, border patrol -- you can just go right down the list. These things, if nothing else, are linked due to our money and now the deficit," Rowley says. Not surprisingly, the people most interested in talking with Rowley at the Rice County Fair are already supporters. Tom Coffield, a self-described longtime Democrat from Webster Township in southern Minnesota, tells Rowley he's very concerned about what's going on in Iraq. Rowley takes the opportunity to make her oft-repeated case that Iraq threatens solutions to most all of the nation's challenges. "People say, 'Well, why are you focused on Iraq?'" Rowley asks. "It's kind of hard not to focus on it, because it's so connected to the other things -- just due to the money if nothing else -- not to mention of course that it's hurting our security, and it's just awful." Rowley favors a fast-paced withdrawal of U.S. troops and the redeployment of smaller force numbers elsewhere in the Persian Gulf. She's decided to run an unconventional campaign -- not paying attention to what many Washington political consultants would advise. Occasionally those sorts of campaigns work. Usually, though, they don't. 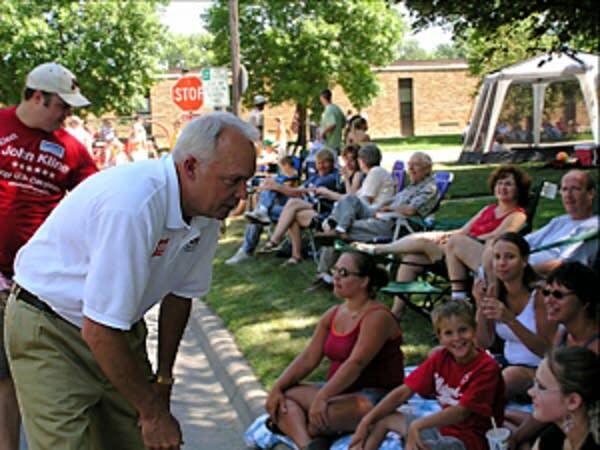 Two days later, Congressman John Kline works voters along a parade route on a steamy morning in Watertown. 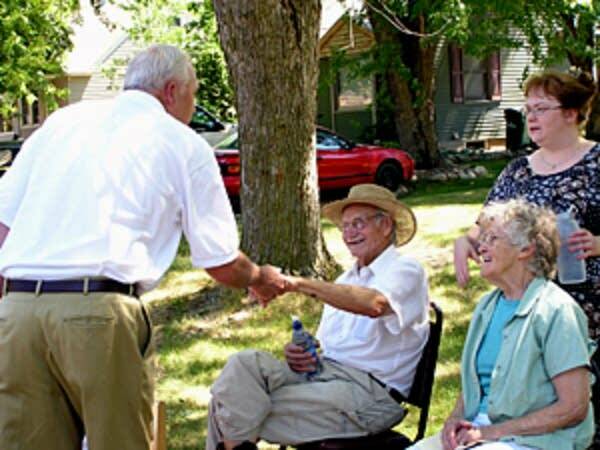 Kline makes quick time, up and down a residential street, quickly shaking hands and moving on. Kline accuses Rowley of waging a negative, attack campaign against him. He says his re-election effort is going well, but notes that it's early and that the real campaign season won't begin until after Labor Day. Just as Rowley talks about Iraq, so too does Kline, but with starkly different message. "This is a choice as we see it. You can choose my view of the country and the world -- a country where we're trying to win this war. We must win this war against Islamic extremists, against terrorists," says Kline. "I have a view that we ought to let people keep more of their own money, so I'm supporting the tax cuts we put in place, and more importantly trying to keep the other side from raising taxes." Kline is in relatively safe territory for a Republican. 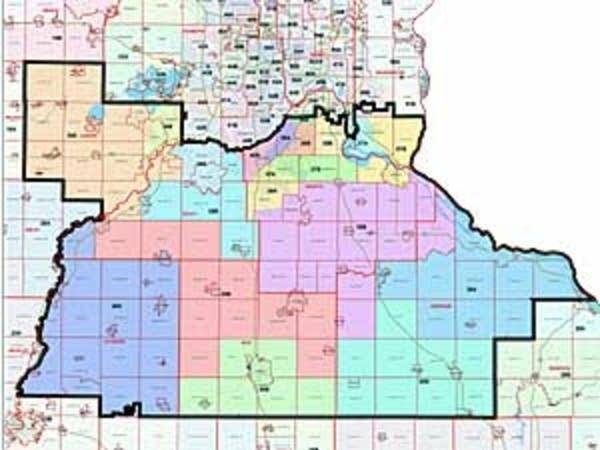 The 2nd District has a reputation as a conservative stronghold. 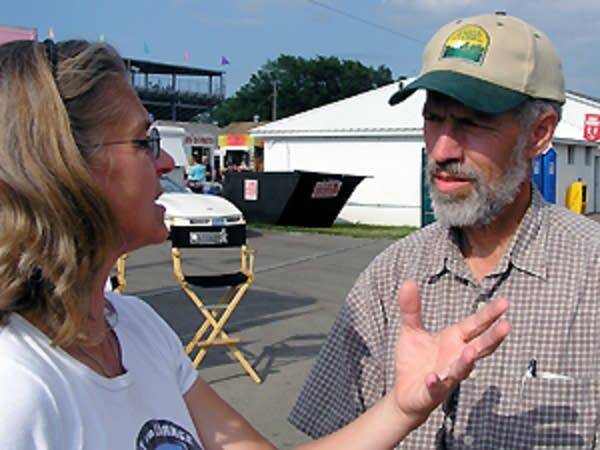 Kline won his last race in 2004 by more than 15 percentage points. Kline says he hears a mixture of opinions about Iraq. But he says even constituents who did not support the invasion are now telling him the U.S. has no choice now but to succeed there. "There is a growing difference in the view on the war against radical Islam," Kline says. "I believe that it's a war that we must win for our own safety and security, and certainly for the prospects for peace in the rest of the world," says Kline. "The Democrats have a growing view that we need to pull back from that war, that we need to get out of Iraq at all costs. And I happen to think that would be disastrous, so I think the voters have a pretty clear choice." Sitting in a lawn chair moments after shaking Kline's hand, Marilyn Haering says she has voted for Kline in the past and intends to support the Republican again this fall. "I think he's honest," Haering says. Haering describes herself as a Republican. But in addition to her Kline sticker, she's wearing an Amy Klobuchar sticker. Klobuchar is the DFL- endorsed candidate for the U.S. Senate. Haering says she's heard about Rowley's campaign, but she thinks Kline has more momentum. When Rowley got into the race, Democrats optimistically predicted her 9/11 whistleblower credentials would position her well to take on Kline. But despite Rowley's high profile, her campaign has struggled with fundraising. She set out saying she wanted to raise $2 million. But, according to campaign finance documents, Rowley has taken in less than $400,000 through June. Kline has raised more than $1 million. Political analyst Steven Schier teaches at Carleton College in Northfield. "Early on, when Coleen Rowley indicated she was running, she got a lot of national press attention," says Steven Schier, a political scientist at Carleton College in Northfield. "It looked like it might be one of the top 10 U.S. House races to watch. Now it's really fallen from contention. John Kline seems to be favored, and he has a big fundraising advantage, so it's been quite a turnaround from several months back." Schier says Rowley has failed to position herself as a moderate, which he says makes it difficult for her to gain traction in the conservative 2nd District. "She's decided to run a risky campaign that is an unconventional campaign -- not paying attention to what many Washington political consultants would advise," Schier says. "Occasionally those sorts of unconventional campaigns work -- Paul Wellstone's victory in 1990 in the Senate race is an example. Usually, though, they don't." Schier cites Rowley's decision to briefly join Iraq war protester Cindy Sheehan's vigil outside of President's Bush Crawford Texas ranch last summer. Rowley defends her campaign strategy. "I think maybe what this political professor or teacher might be saying is that I'm not politics as usual." Rowley seems convinced that voters this year are not looking for the political status quo. "I even say that when I'm marching in parades. I say, 'Vote for change, not politics as usual,'" says Rowley.